Curve Bar Expander Rolls is one of the most effective devices for removing crease-wrinkles, which is normally fitted on the chainless mercerize machine. With this device, we get maximum fabric surface contact area on all the three curved bars which ensures effective removal of crease / wrinkle. 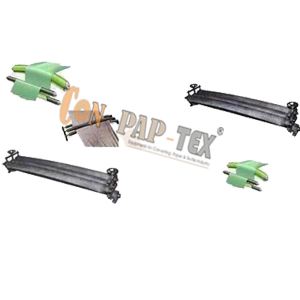 Rubber Curve Bar Expander Roll is used for removing wrinkles from Textile Processing machines.